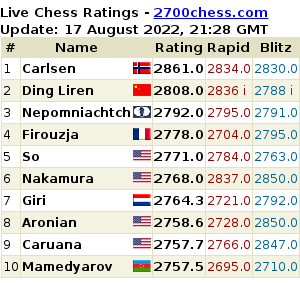 Shakhriyar Mamedyarov has managed to keep his sole lead in the 2nd day of the Tal Memorial Blitz. It wasn't quite an easy task, as he lost to his main rival Alexander Grischuk in the penultimate round and then had to defeat Sergey Karjakin with Black 'on demand'. Alexander's final victory over Vladimir Kramnik hasn't changed anything, and the only thing he could do was to congratulate the sole winner. Right after the finish, Mamedyarov has given us a short interview in which he admitted that a victory in the Tal Memorial blitz was always his dream, as he had already been tied for the 1st place in the classical tournament. Below you can find all the games from the 2nd playing day. 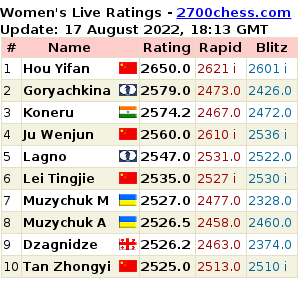 The first playing day of the blitz Tal Memorial is over in Sochi. The hero of the day was Shakhriyar Mamedyarov who has lost only one point (9 victories and 2 draws), thus being the sole leader with 10/11. On the contrary, Alexandra Kosteniuk has gained a single point, having lost 10 games and defeated only Vladimir Kramnik who isn't being in his best blitz shape so far.